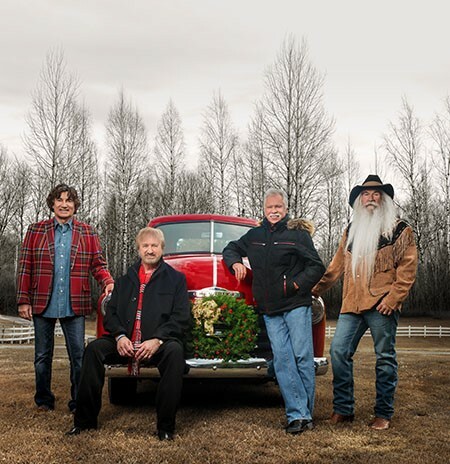 The Oak Ridge Boys Announce 2018 Shine The Light On Christmas Tour | 2911 Enterprises, Inc.
NASHVILLE, Tenn. – GRAMMY® Award-winning and Country Music Hall of Fame members, The Oak Ridge Boys, will once again celebrate the Christmas season with their timeless hits and holiday classics on their 2018 Shine The Light On Christmas Tour. This year’s tour will take the legendary group to 32 cities in 18 states, and is set to kick-off on November 14th in Branson, Missouri. NOV 14 The Mansion Theatre / Branson, Mo. NOV 15 The Mansion Theatre / Branson, Mo. NOV 18 The Maryland Theatre / Hagerstown, Md. NOV 23 The Arena at Southeastern KY Agricultural and Expo Complex / Corbin, Ky.
NOV 24 Honeywell Center / Wabash, Ind. NOV 25 Rialto Square Theater / Joliet, Ill.
NOV 26 Pablo Center at the Confluence / Eau Claire, Wis.
NOV 28 Topeka Performing Arts Center / Topeka, Kan.
NOV 29 United Wireless Arena at Boot Hill Casino & Resort / Dodge City, Kan.
NOV 30 Cheyenne Civic Center / Cheyenne, Wyo. DEC 01 Alberta Bair Theater / Billings, Mont. DEC 05 First Interstate Center for the Arts / Spokane, Wash.
DEC 06 Toyota Center / Kennewick, Wash.
DEC 07 Chinook Winds Casino Resort / Lincoln City, Ore.
DEC 08 Chinook Winds Casino Resort / Lincoln City, Ore.
DEC 09 Little Creek Casino Resort / Shelton, Wash.
DEC 10 Suquamish Clearwater Casino Resort / Suquamish, Wash.
DEC 15 Vilar Performing Arts Center / Beaver Creek, Colo.
DEC 16 Budweiser Events Center / Loveland, Colo.
DEC 17 Casper Events Center / Casper, Wyo. DEC 18 Rushmore Plaza Civic Center / Rapid City, S.D. DEC 19 Mary W. Sommervold Hall at Washington Pavilion / Sioux Falls, S.D. DEC 21 Crystal Grand Music Theater / Wisconsin Dells, Wis.
DEC 23 Schermerhorn Symphony Center / Nashville, Tenn.
For entire tour schedule, please click here. The Oak Ridge Boys, who have sold over 41 million units worldwide, are synonymous with “America, apple pie, baseball, pop, rock, gospel and country music.” In addition to their awards and accolades in the country and pop music fields, they have garnered five GRAMMY® Awards and nine GMA DOVE Awards as well as the Mainstream Artist of the Year Award at the ICM Awards. The group—Joe Bonsall, Duane Allen, William Lee Golden, and Richard Sterban—have earned prestigious membership in the Country Music Hall of Fame (2015 Inductees) and Grand Ole Opry, and are known worldwide as one of recording history’s most extraordinary musical successes. They have charted single after single and album after album, celebrating one double-platinum album and one double-platinum single and more than 30 Top 10 hits, including No. 1 chart-toppers “Elvira,” “Bobbie Sue,” “Thank God For Kids,” “American Made,” “Y’All Come Back Saloon,” among dozens more. For more information and to view upcoming tour dates for The Oak Ridge Boys, please visit oakridgeboys.com.